Ashley Magee, DVM, DACVS, reviews a case of severe pneumothorax in a Great Dane. 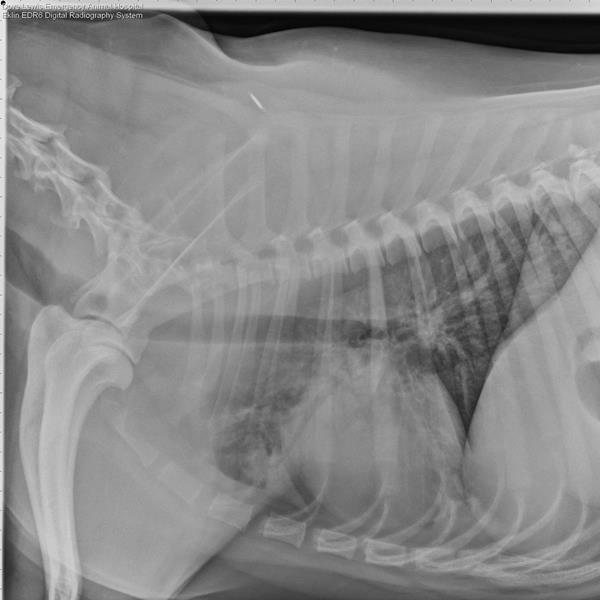 A five year old male castrated Great Dane was referred to DoveLewis for emergency stabilization after being diagnosed with a severe pneumothorax. The day before, the patient has started coughing but rapidly progressed to dyspnea. 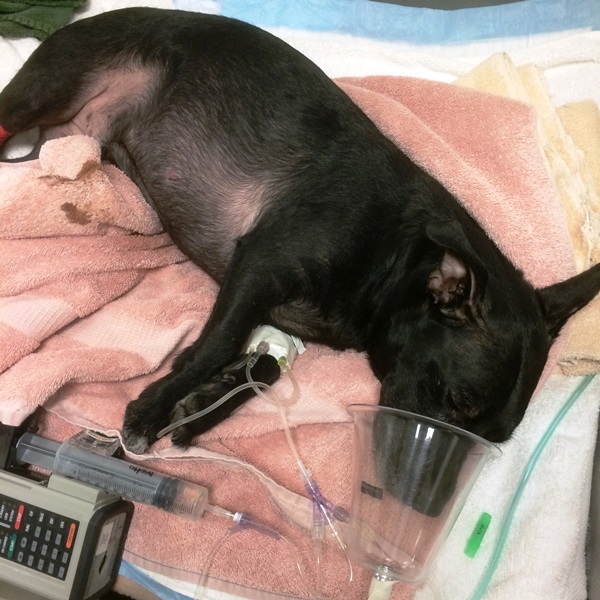 There was no history of recent trauma reported and the dog had otherwise been healthy. Referral radiographs demonstrated bilateral pneumothorax. On admission to our hospital the patient was alert and responsive but visibly dyspneic and tachypneic with abdominal effort on inspiration and dark pink to muddy mucous membranes. On auscultation of the thorax, breath sounds were quiet in all fields. Pulse oximetry was performed with readings of 91% on room air. The patient was sedated and bilateral thoracocentesis was performed, removing 4700 ml of air from the right side and no free air on the left. VD and lateral radiographs of the thorax (Figure 1) were taken revealing moderate bilateral pneumothorax with atelectasis, but no obvious mass or bulla. A second tap was performed on the left side, recovering another 3300 ml of air. The patient’s respiratory rate and effort stabilized after this second tap. A CBC and serum chemistry was performed revealing no abnormalities. He was transferred to the ICU for hospitalization, nasal prong oxygen and fluid therapy. Figure 1: Radiograph of the patient at admission. Over the first ten hours of hospitalization, the patient’s respiratory rate and effort gradually increased to the point that thoracocentesis was required once more. 1600 ml of air was recovered from the right side and 2160 ml from the left side, markedly reducing respiratory rate and effort. By the next morning, the dog’s respiratory rate was again increasing and in light of repeated large volumes of air being removed form the thorax bilaterally, thoracic CT scan was recommended. In order to facilitate removal of accumulating air during CT scan, two 14 gauge fenestrated catheters were inserted into each hemithorax, initially recovering another 2 liters of air total prior to induction of anesthesia. Computed tomography (CT) was performed pre and post administration of iohexol intravenous contrast agent. CT demonstrated a bilateral pneumothorax with a suspected pulmonary bleb, approximately 3 cm in diameter associated with the visceral aspect of the base of the left cranial lung lobe (Figure 2). Some irregularity of the right cranial lobe was also noted but not definitive for a specific lesion. With these findings, surgical exploration of the thorax was recommended. Due to the large size and deep chested anatomy of the patient making access to the hilus of the lungs difficult, left intercostal thoracotomy to remove the lesion followed by right exploratory thoracoscopy with conversion to thoracotomy if indicated, was recommended over median sternotomy. Figure 2: Computed tomography image of the bulla in the left cranial lung lobe. Left fifth intercostal thoracotomy was performed with the patient in RLR. Upon entering the thorax, inhalant anesthetic gas was immediately apparent so the patient was changed to total IV anesthesia (ketamine plus fentanyl CRI) until the leak was found and controlled. A 3 cm diameter pulmonary bulla was identified in the cranial division of the left cranial lung lobe about 4 cm from the hilus on the visceral aspect (Figure 3). It appeared to be leaking air from a small perforation at its perimeter. A second 1 cm bulla was found closer to the hilus. Both portions of the left cranial lobe were removed due to persistent consolidation in the caudal portion. The remaining left lung was evaluated and no further lesions noted. A thoracostomy tube was placed and the thorax lavaged then closed routinely. The patient was placed in LLR and prepared routinely. Thoracoscopy was performed via a lateral intercostal approach and exploration of the right hemithorax performed. The right cranial lobe had several superficial pale plaques but no subpleural air was detected and the lung was normally aerating. The right middle lung was consolidated with a possible hilar bleb noted, but access to this aspect of the lung was challenging with the endoscopic approach used. The left caudal and accessory lobes appeared normal. A 10 cm mini thoracotomy was made through the right 5th intercostal space to allow direct visualization and palpation of the right middle lung lobe. No blebs were found. The right hemothorax was lavaged, a thoracostomy tube placed, and the incision closed in standard fashion. Figure 3: Intraoperative image of the lesion. The patient recovered routinely with negligible amounts of air and fluid recovered from the thoracostomy tubes post-operatively. His chest tubes were pulled 24 hours post-op and he was discharged from the hospital 36 hours after surgery. Histopathology of the removed tissue demonstrated severe atelectasis with locally extensive pleural fibrosis and focal pleural granulation tissue with minimal lymphocytic or neutrophilic inflammation, consistent with a ruptured bulla. No evidence of infectious agents or neoplasia was noted. This patient had an uncomplicated recovery and had no recurrence of respiratory issues as of last exam at 14 months post-op when the patient underwent emergency surgery for gastric dilatation and volvulus. In the patient of this report, primary spontaneous pneumothorax resulted from rupture of a pulmonary bulla. No evidence of underlying disease was found at surgery or on histologic evaluation of the resected tissue. No previous history of trauma or respiratory disease was reported to identify the cause of bulla formation in this patient. Idiopathic spontaneous pneumothorax tends to occur in large, deep chested dogs, as in our patient. Etiology for the formation of these bullae and blebs are unknown. Siberian Huskies are overrepresented in the reported literature (1). Patients with a ruptured bulla present in acute respiratory distress, often preceded by a brief period of coughing. Physical examination demonstrates varying levels of respiratory distress including tachypnea, increased respiratory effort, tachycardia, exercise intolerance, decreased lung sounds and cyanosis. Decreased oxygen saturation is often apparent on room air. Initial diagnostics include bilateral thoracocentesis, cbc, serum chemistry and blood gas analysis, and thoracic radiography. Thoracocentesis is highly therapeutic and should be performed prior to radiography as these patients can decompensate rapidly when restrained and/or sedated. CBC and serum chemistry are often normal and venous or arterial blood gas changes will reflect decreased ventilation and perfusion associated with impaired ventilation. Thoracic radiography demonstrates pneumothorax, usually bilateral. Bulla or blebs are visible in less than 30% of cases (2). When an obvious lesion is not detected, hospitalization and medical management with intermittent thoracocentesis or aspiration via thoracostomy tube placement is recommended. Surgery is recommended when the patient requires repeated and persistent air removal over 24-48 hours. CT scan is often utilized to localize the lesion(s) to determine the best surgical approach. Although detection of ruptured bulla with CT scan is reported to be relatively low,(3) in our experience when they are visible with CT scan, the information is helpful for surgical planning and minimizing morbidity in patients secondary to median sternotomy. While median sternotomy allows visualization of all the thoracic structures with one approach, access to the lung hilus for lobectomy is challenging, especially in large to giant breed deep chested dogs. In addition, recovery time and rates of incisional complications are increased for patients undergoing median sternotomy. The detected bulla in this patient was in the hilar region and required complete lobectomy. This would have been quite challenging through a ventral approach in a patient of this size and was easily performed via intercostal thoracotomy. Because bulla are often multiple and bilateral in nature, all lungs should be explored to allow detection and removal of other non ruptured bulla. In the patient of this report, a second smaller bulla not noted on CT was found on exploration and removed. In order to rule out pathology in the opposite hemithorax, thoracoscopy was performed to evaluate the lungs. Because this modality also has a less than optimal rate of detection of bullae and blebs(4), a mini thoracotomy was also employed to confirm the lack of a lesion in one lobe. Reported success rates for surgical management of primary spontaneous pneumothorax is fair to good, with reported recurrence rates of 0-25%, versus 50-100% with medical management alone (1-2,5). Surgical management of primary spontaneous pneumothorax in the patient of this report has been successful with a rapid and complete recovery and follow up of over 14 months to date, demonstrating that rapid detection, stabilization and surgical intervention can provide a successful outcome for dogs affected with this life threatening condition. 2. Maritato K, Colon JA, Kergosien D. Pneumothorax. Compendium 2009 May; 31(5). 5. 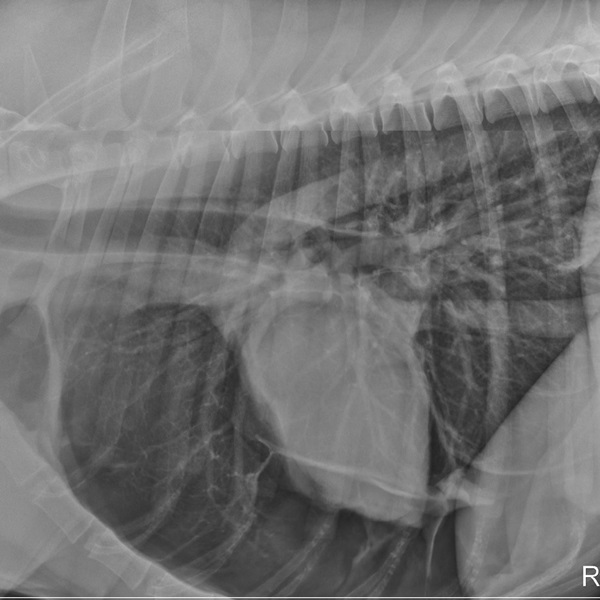 Lipscomb VJ, Hardie RJ, Dubielzig RR: Spontaneous pneumothorax caused by pulmonary blebs and bullae in 12 dogs. J Am Anim Hosp Assoc 2003 Sept-Oct; 39(5):435-45.